HOUSTON -- Toronto might start calling Mark Buehrle the streak buster. For the second time this season, Buehrle ended a Blue Jays seven-game losing streak Sunday. He allowed one run over eight innings and the Toronto Blue Jays rallied for two runs in the ninth inning to walk away with a 2-1 win over the Houston Astros. Buehrle (10-7), who also ended the Blue Jays previous seven-game skid with a shutout against the Houston Astros on July 25, allowed seven hits and struck out seven in winning his fifth straight. He has allowed seven runs over 27 innings, spanning his last four starts. "If you last long enough, good things are going to happen," Buehrle said. "It would be nice to get runs early on, but you have to tip your hat to their pitcher keeping the guys off balance when you got guys on, getting ground balls. Tip your hat to him for not letting us score. Again, we battled until the end. That's why you play 27 outs. We scored runs at the right time." With the win, Buehrle has earned at least 10 wins in 13 straight seasons, which matches CC Sabathia for the longest active streak in the majors. "I'd rather forego some of the personal stuff for being in a better position than where we are right now," Buehrle said. "At the end of the day when the season is over and you look at the season, I feel like I am having a decent season, but I have six or seven starts left, so I have to finish strongly and get as many wins as I can." Casey Janssen pitched the ninth for his 23rd save. Toronto manager John Gibbons said the win felt good because they have been hard to come by of late for the Blue Jays. "We have been in so many games on this road trip -- all of them except the last two games here where we came up short -- so that is eating at you," Gibbons said. "Then, of course it is a losing streak, so winning the last one here always feels good. It doesn't make things any better where we are at right now, but it was something we needed." Moises Sierra drew a bases loaded walk to tie the game at 1-1 in the ninth. Following Sierra's walk, Chia-Jen Lo (0-2) struck out Kevin Pillar before Kevin Chapman induced a run-scoring groundout by Ryan Goins to put Toronto in front 2-1. After Chapman walked Jose Reyes, Philip Humber got Rajai Davis to ground out to end the inning. Dallas Keuchel gave up four hits and three walks with two strikeouts in seven innings. He had allowed four or more runs in each of his last three starts and had allowed at least a run in every start this season. Keuchel did not allow a Blue Jays runner past second base. "I just wanted to go out there and work as quickly as possible and give our team a chance to hit," Keuchel said. "But (Buerhle) was pretty much matching me pitch for pitch, and it was actually pretty fun. The last thing I wanted to do was have a long inning, and I am a fast-paced working, so it was nice to see another fast-paced working in Buehrle." Matt Dominguez scored on Jake Elmore's double play groundout to give Houston a 1-0 lead in the second inning. Houston worked the bases loaded with nobody outs as Dominguez walked to lead off the inning, followed by singles by Brandon Barnes and Villar. Buehrle worked out of the inning on Elmore's double play and got Clark to ground out to end the inning. "Those veteran guys, when you get them on the ropes early, you want to do everything you can to put crooked up and give yourselves a cushion," Houston manager Bo Porter said. "As you can see, (Buehrle) got out of that, he only gives up the one run, he gets into a groove, and he ends up going as far as he went." Buehrle had a nice play on an Elmore line drive in the seventh as he took it off his hand, chased it down going to first base and flipped it over to Encarnacion at first using his glove for the second out. After a visit from Toronto manager John Gibbons and the trainer, Buehrle stayed in the game and struck out Clark on three pitches to end the inning. 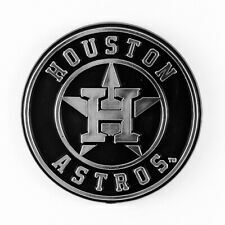 Houston C Carlos Corporan, who has been on the 7-day disabled since August 20 with a concussion, will not make the upcoming trip to Chicago with the Astros. Corporan said he still has headaches, adding that he had a CT scan Friday that came back "good". ... Porter said RHP Jarred Cosart will start Wednesday's game against the White Sox. The Astros had yet to make a decision on Tuesday's starter. ... Toronto has now lost four of the last five series. ... OF Kevin Pillar's home run Saturday night snapped a streak of 25 straight games without hitting a home run with runners in scoring position.